This magnificent Sideboard has a place to store 4 bottles of wine along with 2 small drawers and 2 storage compartments. This will provide a lot of space to store dishes, linens, and other products needed to throw a great dinner party! 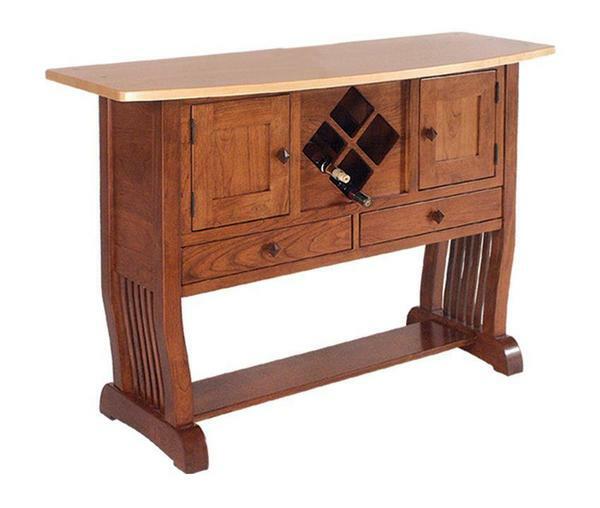 Built with beautiful 100% solid hardwood, this sideboard will last for generations! Please find attached pictures of the furniture I bought from you. As an Antiques Dealer we are VERY resistant to buying new furniture, finding that quality and Craftsmanship are usually much better in Antique pieces compared to modern ones. I couldn't be more wrong with regards to the Amish furniture I purchased from you. The quality and craftsmanship is superb. The chairs weigh a ton and are extremely comfortable. The drawer and door mechanisms are as smooth as silk. I can find no flaws in either the quality OR the workmanship. This set will stand the test of time-it truly is an Heirloom for the future! I feel that I got every penny's worth that I paid for and I could NOT be happier. Outstanding! I wanted to let you know how pleased we are with the furniture-it was well worth the wait!